Have you ever wondered if you are looking at porcelain tiles or ceramic tiles when you are completing your due diligence before making your tile selection. As designers in the industry it’s probably something you learned in school, however for the average homeowner or commercial investor, it is usually not something you are concerned about. Porcelain and ceramic are similar, in that they are both made from clay and kiln fired. That in turn makes them very different from other categories of tiles, such as glass or natural stone. While glass tile and natural stone tiles may be used more often these days; the words porcelain and ceramic are often used interchangeably, differences between the two types of tile can make a difference in the cost, appearance, and longevity of your installation. Differences between porcelain and ceramic tiles are wide and varied. Ultimately, identifying a tile if it is categorized as porcelain only when the moisture absorption rate is .5% or lower. Ceramic tile is less expepnsive for sure, easier to install, and in these high end setting can provide you with more color selections than porcelain. Typically ingredients of porcelain tiles are more refined, and it is fired at a greater pressure and higher temperature than ceramic, making it much harder and denser, and consequently, more expensive and more difficult to install than ceramic. But cost is only one consideration among many. About Glazed and Through-Body Porcelain – A glazed porcelain tile has a coating that fills in any microscopic holes on the surface of the clay. This will make it easier to keep clean than unglazed tiles. 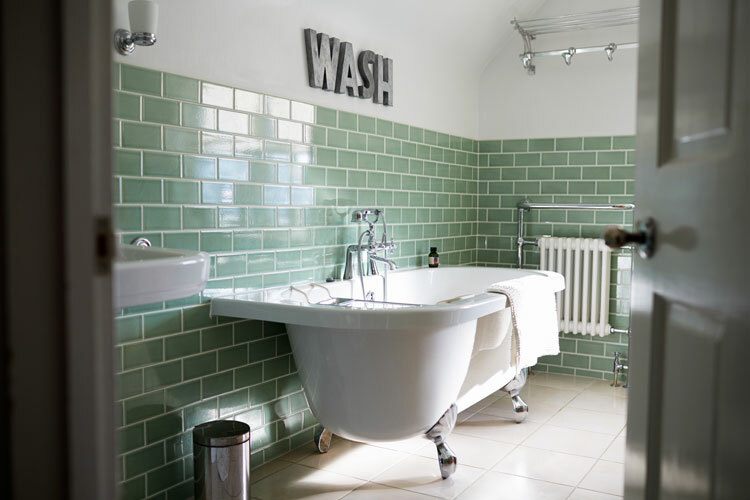 However, unglazed tiles are better for slip resistance and less likely to show signs of wear, since the color on the surface is the same color that runs through the entire tile. Proper Tile Care and Maintenance should be ongoing – Tile floors should be swept and damp mopped regularly and professionally cleaned by someone like Clay Floors as needed. Establishing a regular maintenance program is easily accompolished and will help you maintain the integrity of your investment over time. Porous grout lines can be sealed to inhibit staining and to make regular cleaning more productive as another option. When grout color sealer is applied to grout lines, they become impervious to stains. With all the benefits of clear sealer, grout color sealer offers numerous additional benefits, including constant-acting mildewcides and fungicides. Unglazed porcelain tile, although less porous than natural stone, might be subject to discolorations and staining with traffic and use. These surfaces should be professionally sealed once per year or more by a seasoned professional. Glazed ceramic or porcelain tiles do not require sealing, but may need slip resistance treatments, depending on the way the space is used. If you take a few minutes to consider all the factors, and not just price, when you make your purchase decision for new floors and surfaces. Keith Clay Floors is willing to work with you and your designer in providing information about the products you decide to use in your specific build. Tile or porcelain selections may depend on availability, new or used, and many other factors that may determine their specific use. Thank you for taking the time to visit Keith Clay Floors today. 30 years experience means a lot when you are making a decision about flooring, tile, and all manner of natural stone products. We are here to make sure you can make an educated decision about what will work best in your situation; and then help you keep your investment valuable. Keith Clay has been in business for 30 years serving Dallas, Frisco, Plano, Richardson and all Dallas Metroplex suburbs. We know tile, natural stone, and mexican tile floors and can answer any questions you may have. If you want the best job from a company of professionals, call us today. 972-463-6604.